The period between Passover and the festival of Shavuot is known as the period of the Omer. There are many customs and traditions attached to this period. Before we understand what are the various customs and traditions, it is worth while to understand what is the meaning of the word, "omer". The omer is a dry measure that was used to measure a quantity of grain, similar to a peck or a bushel. The Torah requires that on the day after Passover, the 16th of Nisan, an offering of barley be brought to the Holy Temple as an offering. In Leviticus 23:10, it speaks about the Passover festival and continues saying, "When you come into the land which I give to you, you shall reap your harvest and bring an "omer" of the first fruits of the harvest to the priest. He shall wave the "omer" before the Lord…"
Later in this same chapter Leviticus 23:15, the Torah continues: "And you shall count from the day after the day of rest (meaning here Passover) from the day which you have brought the "omer", seven complete weeks for yourselves. Until the seventh week, you shall count fifty days and then bring the new meal (wheat) offering to the Lord." Basically we see two separate but related things. One is the need to bring the "omer" of barley to the Temple. The second is the need to count the days. Although today, we do not have the Temple, soon it will be rebuilt and this service will be restored. During the time of the Temple, the representative of the people, an official appointed by the high courts would go into the fields on the eve of Passover. He would bind some of the barley stalks that were growing, designating and preparing them for the next night. On the night after Passover, they would descend into the field in a great ceremony together with all the local villagers. They would reap approximately ten "omers". This barley would then be brought back to the Holy Temple where it was threshed, winnowed, sieved and roasted. After the chaff was separated, it was ground in a stone mill. During the Temple services of the day, the priest would take the omer of barley and wave it in the four compass directions which acted to prevent harsh winds. He would lift it up and down to prevent harmful dew. Until this ceremony was performed in the Temple, it was forbidden to eat from the new grains of the five species: wheat, barley, spelt, rye and oats. Today we wait until the seventeenth of Nisan to eat grains from the new harvest. Although the bringing of the Omer is not applicable unless the Temple is standing, the counting is still a very viable part of our tradition. We begin counting the days of the Omer, which are the days in between Passover and the festival of Shavuot. The correct time for the counting is at night - this is the beginning of the Jewish day. Since the Torah said "complete" in reference to the counting, we begin at the beginning of the day. If one forgot to count at night he still may count during the following day. Normally a blessing is made prior to counting. "Blessed are You, G-d, our Master, the Lord of the universe, who has sanctified us with His commandments and has commanded us concerning the counting of the Omer." If one did not make the blessing, but just counted, he does not go back to make the blessing, since this blessing is not really part of the commandment. For the first week he counts the days: "Today is the fifth day of the Omer". From the second week onwards, he counts the days and the weeks: "Today is the eight day of the Omer, which is one week and one day." The counting is made standing up. There are other prayers that are attached to this ceremony as per local custom and they are found in the various prayer books. If a person forgot one day to count, meaning he forgot not just at night, but also during the day, he may still continue to count, but he is no longer allowed to make the blessing. This counting continues until the forty-ninth day is counted. Once this is reached there is no more counting. Since during this period, twenty four thousand pupils of Rabbi Akiva died. Spread out all over the country, they died in a mysterious plague. The Talmud explains that the reason for this terrible tragedy was because they did not treat each other with respect. Now this is of course very hard to comprehend. Was not Rabbi Akiva the one who taught us that we must love every Jew?? The explanation is as follows. The pupils of Rabbi Akiva would argue with each other, each one contending that he understood the teachings of Rabbi Akiva properly, but not his friend. Since he believed that he, and only he, possessed the proper understanding of their Rabbi's teachings, he would make fun of his friends understanding. Because of the lack of respect that each had for the other, and since they could not accept the other's view, they slighted one another. This was a great disgrace for their master, Rabbi Akiva, that his pupils should conduct themselves with such disrespect between each other and therefore, heaven saw it fitting that they should die. Each day during this certain year, during the Omer period, hundreds of his students would die. With the exception of the thirty-third day of the Omer, the deaths continued until the last day of the Omer. On this day, the 33rd of the Omer, was seen as a special day. Partly because none of the above mentioned students of Rabbi Akiva died and also because it was the day that Rabbi Shimon Bar Yochi died. Now Rabbi Shimon Bar Yochi, known also by the initials Rashbi, was a pupil of Rabbi Akiva but from another period in time. He is credited with keeping the Torah alive during the time of the Romans and is the famed author of the Zohar, the mystical basis of our Kabbalah. Therefore the 33rd day of the Omer, being a special day, takes on a festive nature and weddings and haircuts are permitted on this day. We see from the death of the pupils of Rabbi Akiva that this period is one of heavenly judgement. Since this is a period in which the "mazel" is not good, we refrain from making weddings at this time. We also refrain from getting haircuts and wearing new clothing. Music that brings one to joy is also omitted during the period of the Omer. 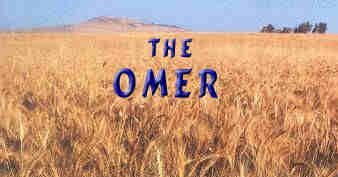 There are various periods of observation of the Omer. Some start with the last day of Passover and stop at Lag B'Omer. Others start with the beginning of the new Jewish month of Iyar and continue the Omer observance until three days before Shavuot. Many Chassidim observe the Omer period from the end of Passover until Shavuot. All customs, however, agree that the 33rd of the Omer, which is Lag B'Omer, there is a suspension of the period of refraining and a general happy day.